Akron, OH – When the cold weather rolls around, there’s nothing like a cup of freshly brewed hot tea that’s been infused with a squeeze of lemon or grate of ginger or turmeric. Or, when it gets hot outside, enjoying iced black tea with a refreshing hint of citrus can be the perfect pick-me-up. That’s why Zing Anything is introducing a Tea Zinger Infusion Set, an ideal holiday gift that makes it easy to brew single-serving, café-quality, infused tea from the comfort of home. With an optional steeper basket for loose leaf tea, a grater for infusing ingredients like ginger, turmeric and orange peel, and a citrus press to add fresh citrus, the Tea Zinger Infusion Set is perfect for creating favorite tea blends. Designed in the USA, this 22oz stainless steel, BPA/EA-free bottle is simple to use, easy to clean, and keeps drinks hot for 4-6 hours. 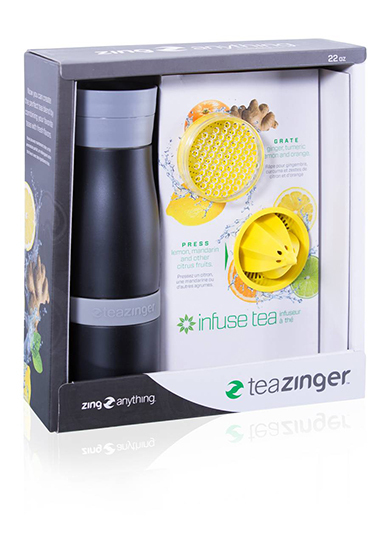 Zing Anything’s Tea Zinger is sold online and at retailers nationwide for an SRP of $29.99. Visit www.zinganything.com for more info.